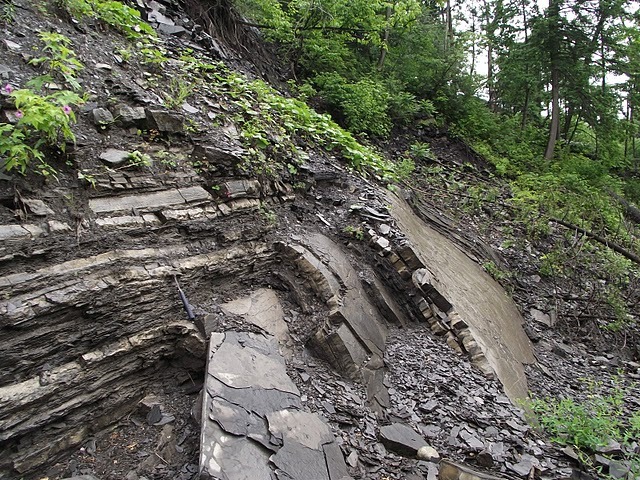 This month’s Accretionary Wedge comes from on-the-rocks over at geosciblog. As I am slow to post lately (it is summer, after all), I thought I would piece a small post together on the topic “Stuff left behind, with regrets”, and I must say, the topic is an intriguing, if not somewhat difficult for me to tackle. We’ve all left many things behind. My buddy Christopher, over at Geology Melange left behind some tremendo-breccias and some borked crinoid fossils. Others have mentioned photos they decided not to take and other misfortunes along the way, and though I have few regrets like this, picking one place in which I should have snapped a few extras would be impossible at this point in my life. But what do I regret leaving behind – and how could I turn it into a tasty piece on geology? I left my heart in Moab, Utah! I left a 16″ cutthroat trout sitting under a bridge in Rocky Mountain National Park! Well, that one would have been illegal, anyway. We as geologists tend to get a little excited in the field sometimes. One particular explosion of excitement happened to me no longer than a month ago in Dolgeville, NY. To most, Dolgeville is not a geologic mecca. This is too bad, as the amount of pristine geology in a relatively small area is certainly impressive. The location I am speaking of is a dam located on a tributary of the Mohawk River, one of the few (maybe the only) accessible dams or locations in the area exposing the Dolgeville Fault. Now, I have seen my fair share of faults. The beautiful grabens (I think?) outside of Arches National Park, many along roadsides throughout America’s deserts, hell – I even mapped a phantom fault in the vicinity of Fonda, NY (the fault is there, you just cannot see it in outcrop). So what made Dolgeville so amazing? What you’re seeing here is a fault. Not your typical offset/hanging wall/footwall view. No. That nice, smooth surface in the left – is the actual fault exposure, slickens and all – once the epicenter of tremendous heat, pressure, and all the sigma-1 you can shake a willow branch at. It was the first time I have ever seen anything of the sort, and even as one concerned mainly with dirt, mud, mud falling off of hills and piles of rock in rivers, this was and amazing sight. But what is it that I left behind? Well, look towards the middle-right of the photo near where the slope starts. You guessed it, that’s a chevron fold. A little closer. (Not) Ron Schott's Estwing rock hammer for scale. Or is it? It’s definitely not a mega-scale chevron, but boy is it a beauty. Overall, the size of a sample would have been kind of bulky, and at this point we had been collecting rocks and becoming less and less organized, as well as patient, with the space in our Ford trip van. Albeit, some of the members of the trip were able to collect some chevrons – not of particularly impressive stature but still, beautiful samples to have. Thus, I regret not jostling free a piece of this particular fold. I should also mention that this is the second chevron I have passed on. 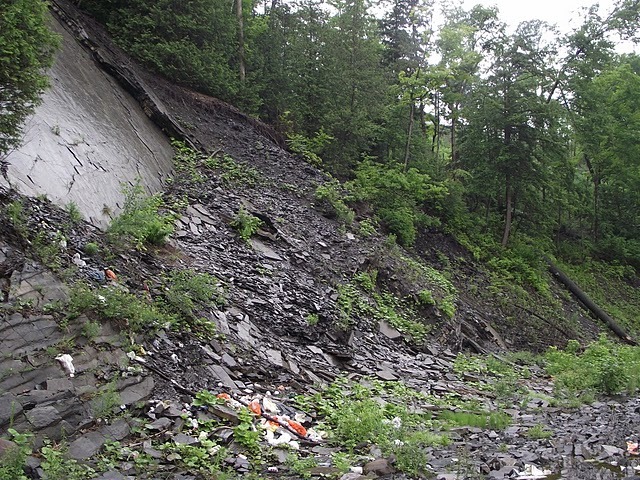 The first one I did manage to collect was of some folding siltstone in southern Pennsylvania during a structural geology trip through SUNY Oneonta in which I was piggy-backing on the way to GSA Baltimore in 2010. I grabbed it, admired it in the van for the following days, but in time decided that it would be most appreciated in a glass display case at my Alma mater, SUNY Oneonta. This decision, however, I do not regret.